We finally got the little fellow. It took a box cage and a carrot (we had been trying lettuce up until this point, guess he didn't like the stuff). So late last night we hopped in the car with our new pet and took him to one of our least favorite contractor's house. Oh, will he be surprised this morning! Lucky for us he doesn't lock the truck. While it was tempting we were raised right and didn't resort to levels unbecoming of us. It seems to have done minimal damage to the room. Just tore out some of the insulation. 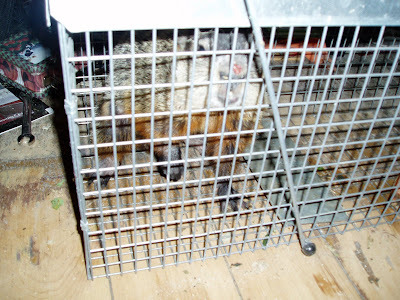 My biggest fear in live trapping was when the county extension agent said, "Don't leave him in the trap too long, they can chew right through those wires." I had visions of catching the groundhog and while driving out to Macbride reservoir it would attack me from behind!